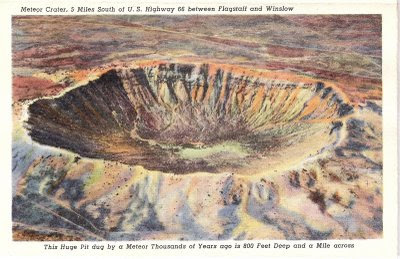 One of Arizona's great wonders is Meteor Crater between Flagstaff and Winslow. This is a 1941 illustration of the first confirmed meteorite impact site on the planet. This hole in the ground is a powerful testament to what happens when a rock from space collides with the earth. We will be offering a limited supply of Arizona's Canyon Diablo meteorites at the Dusty Boots Benefit. As well as other gems from space--rocks that are as old and older than the earth itself!